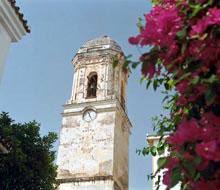 The old clock tower in Estepona. On the western Costa del Sol, at sea level, 81 kilometres from Malaga, Estepona is one of the most westerly towns on the Costa del Sol, situated between Marbella and Manilva at the foot of the Sierra Bermeja mountains. It is thus protected from the cold northern winds and maintains a mild climate all the year round. The town centre conserves its old, typically Andalusian style of architecture and town plan, balconies decorated with flower pots and whitewashed houses. Estepona is also one of the most important tourist towns on the southern coastline, with magnificent beaches and facilities, excellent hotels and restaurants. It has a very prestigious riding school, the Escuela de Arte Ecuestre de la Costa del Sol; a wildlife park (Selwo) that is among the best in Europe, and a host of sporting facilities for both water and mountain. Town Hall, Plaza Blas Infante, 1, Estepona.29680. Tourist Office, Avda. San Lorenzo, 1, , Estepona. 29880. The Phoenicians, Romans and Moors have lived here, and the area was probably first settled by the Phoenicians. The most important archaeological remains in Estepona are those of the river Guadalmansa area, where the remains of hot-springs, very likely dating from the time of the Roman city of Salduba, were discovered. The town was conquered by the Moors at the beginning of the eighth century, and a fortress called “Munt Nis” or the castle of Nicio, was built. Later, in the time of the Abderramán II Caliphate, another fortress was built, this time known as Estebunna. It fell to the Christians in a raid by Enrique IV of Castille in 1456, and from this time on the town became known by its present name, and the castle was re-built. For a time, during the reign of Juana La Loca, Estepona was part of the judicial area of Marbella, the population at that time being 600.On April 21st, 1729, Estepona was granted administrative independence in a Carta de Villazgo signed by King Felipe V in Sevilla, and the very documents pertaining to this signing are still in the municipal archives. The festival of Estepona’s patron saint, San Isidro Labrador, takes place on May 15th, in which the people head for the countryside and hold processions in the town later on in the day. The Feria and the Fiestas Mayores of the town take place during the first week of June in the feria grounds, and there is also feria by daytime in the town centre. Estepona also had another patron saint, the Virgen del Carmen, and the corresponding festival is on July 16th, which involves a procession aboard fishing boats on the sea, carrying the image of the Virgin on board. Phone 952 88 07 00. Las Dunas Beach Resort and Spa (5*) GL. Ctra. N-340, Km. 163. Kempinski Hotel (5*) GL. Ctra. 340. Km 159, Estepona. Gran Hotel Playabella (5*). Ctra. 340. Km 165, Estepona. Atalaya Park (4*). Ctra. N-340, Km. 169, Estepona. Paraiso Costa del Sol. Ctra. N-340, Km. 168, Estepona. Hotel Club Diana Park. Ctra. N-340, Km. 169, Estepona. Hotel Dobar (2*). Avda. España, 178, Estepona. Apartamentos Albayalde. Ctra. N-340, Km. 165, Estepona. Pensión Europa. Ctra. N-340, Km. 157, Estepona. Pensión El Pilar. Pza. Las Flores, 22, Estepona. Camping Parque Tropical. Ctra.N-340, Km. 162, Estepona. With its interior recently refurbished, the Church of Los Remedios is in the Plaza of San Francisco. It originally formed part of the Franciscan Convent built at the end of the 18th century, but the religious community left on the proclamation of the Law of Disentailment (sale of Church lands) in 1835. The interior is divided into three naves separated by semicircular arches on pillars. The tower, built in 1795, has four storeys and is topped by a pyramidal spite with a ceramic roof. The most outstanding architectural element on the outside is the carved stone doorway, dating from the year 1772. The hermitage of El Calvario is a small 18th century building, square at the base and arris vaulted with a simple exterior. The tower of the old parish church is the only element remaining from the primitive church, and was built in a peculiar form into the main building. It was built in 1818, at a time that other reconstruction work was also carried out on the whole. The 20 metre-high lighthouse was built in the 19th century. Situated in the Plaza de Toros, in this museum we can see the tools and implements used in both farming and fishing in times gone by, since Estepona has a long tradition in both fields. More recently, the farmers of the area have been producing large quantities of citrus fruits, and also cultivating newer crops like avocado pears and aloe, more usually associated with tropical climes. Also situated in the Plaza de Toros, this houses an interesting collection of posters, photographs, bull-fighting suits and other documentation that brings us back into the history of the art. This museum holds a collection of the fossils from the Plioceno period, about four million years ago, found in the Estepona area. Here we can see archaeological remains from various periods, most of the pieces discovered quite by chance or during archaeological digs. Although Estepona lies at sea level, the greater part of the municipality is mountainous. The Sierra Bermeja mountain range is right behind the town, its highest peak being the Pico de los Reales, at 1, 449 metres. This area is of important ecological interest, within which we find the exceptionally beautiful Paseo de los Pinsapos. This is a nature park filled with a species of fir tree very rare in Europe, the pinsapo. It is a favourite picnic area, and the drive up provides quite spectacular views over the coast and Africa.